Dreaming to have an own website with an own domain is much wanted of billionth of web publishers and much of the bloggers in entire blogosphere. As a blogger I own a blogsite which is a sub- domain of Google. And I always wanted that in the coming days, I will own a domain that I originally paid from the other domain and hosting company. Such as the HOSTGATOR- for me Hostgator is the best hosting coming, one of it’s best is the 24 hours support whenever you got errors of our site. Like what happen in my side. Now, talking changing from blogspot.com, like example.blogspot.com to your own or custom domain to example.com is not easy. More likely if your not knowledgeable in coded and design or a beginner of web hosting and domain management. But actually web hosting company like Hostgator can support of you through chatting. One of the most problem I encountered that before I migrated to wordpress, now I purchase another domain in Hostgator. My very problem in my migration is, I myself not registering my blog, instead I trust it to my co-teacher. But I will told you that this idea is not good. It will cause compromise in the part of you. When the time that your domain will expired. And you’re not satisfied in the new platform that you migrated, such as the wordpress. Now I’m back in blogger platform, now I strive to solve all the problems that I will encounter when I falling back in blogger platform. If you successfully solve the problem with your cpanel in your new domain registration. Like the cname and the A type of your DNS. Actually if your registering before with your old domain then buy a new domain. You will probably encounter mix cname exist. But this problem would be solve by the technical support of your domain hosting. Then when this successfully solve by your domain company, another problem you will need to consider is the redirection of your blospot.com to your new domain name like www.example.com. This you need to coordinate with the technical support of your domain hosting. That Google will recognize or verify you as the owner of your own custom domain. Now if this successfully solve, another problem again will rise, such as the webmaster and Google analytics. There are much tutorial with this like the Google product forum. 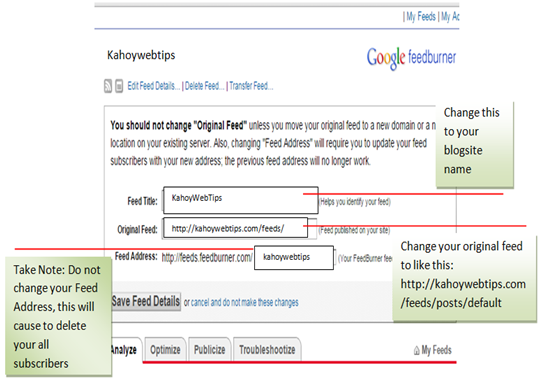 Now, what I much to impart is “How to change our feedburner’s original feed and feed titles that the subscriber list will not deleted or affected?”. when you encounter with this and tried your self to change it without knowledge. I’m surely sure that the feedburner feed will throwing you much error that will cause you to scratch your head. Just what I experience here. And I tried to find exact tutorial with this problem. But later I solve with my own idea. Just follow below this post how I solve the problem. Just see also my post picture above to see what I did. Once your there, just select your feed account listed. Then locate the bar said “Feed Title” and type there, the Feed name that you desire, such as what I did in my post picture. Be sure to change my example.com to your website domain name. Try to use the toubleshootize button below of the feed address, so that you can ping your feed address. Then you will see that you feedburner account is normal now. Then copy the feed address, then open you blog settings. Then click save settings button at the top right side of your screen. Then ping again your feedburner if will fetch your files or post of your blogspot site. Be sure to submit your sitemap in webmaster tools. 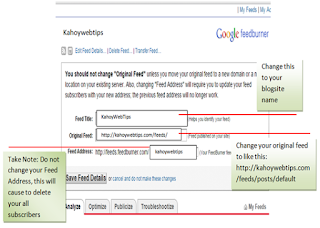 To change your URL of your blogsite to your own custom domain. Do not delete your old blogspot registered in your webmaster but find the list menu called change address. In your google analytics also do not delete it or create another one. All you have to do is to create your tag manager to verify that you’re the owner of the new domain that you have. See you next post.